If you are looking for a high quality vertical blinds supplier within the Edinburgh and Fife areas, then you have come to the right place at 1st Choice blinds Edinburgh. We supply high quality, and reasonably priced vertical blinds covering a whole different range of styles and colours. Vertical blinds provide an excellent way of controlling the amount of light that you can allow to enter your room or office space. 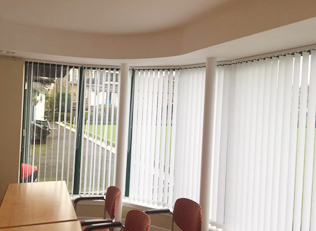 Vertical blinds can also be one of the more cost-effective options if you are looking for a solution using blinds within your home or a professional setting. 1st Choice blinds has been providing custom solution vertical blinds in and around Edinburgh, and Fife, for several years now. 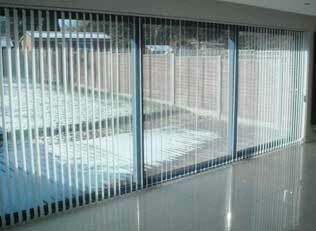 We have had nothing but fantastic feedback on our vertical blinds installation services and products. We would be happy to speak with you today and find out exactly how we can provide you a high-quality vertical blinds selection and installation service, that will fit your needs to perfection. Our friendly and functional vertical blinds have remained a popular choice over the past few years. Always stylish yet quick and practical, these window blinds will fit perfectly into your home or office while offering enough privacy and light restrictions with ease. Selecting your ideal design, style, colour and material could not be easier. As with all our custom made blinds, they will save on your energy bills in winter while keeping out unwanted light in the summer months. Our vertical blind selection is a fresh blend of vibrant colours and prints, manufactured using only the best quality materials that include weaves, Teflon, cotton, and polyesters giving you a product that shines with class and distinction. Presented in 88mm or 126mm width louvre, tilted for full light and privacy control all our custom made blinds are manufactured to your precise specification. With the bonus of many of our fabrics being machine washable, you can be reassured that our blinds will stay in pristine condition for years to come. For help in choosing your perfect vertical blinds, visit our online swatch and view our full selection of colours and fabric designs. Vertical fabric louvres, tilted for light and privacy control. Wipe-clean, PVC, Teflon and fire retardant finishes available. 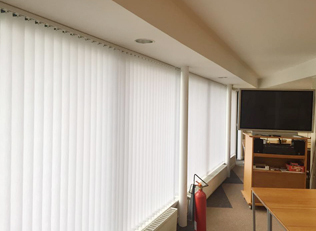 Sheer, dim-out and glare reduction fabrics are also available. Choice of 2 louvre widths: 89mm and 127mm. Tilt and pull back blinds with a wand or sidewinder. Since 2014, all new blinds manufactured must be ‘safe by design’ and be supplied with child safety devices fitted as standard. This means that any blinds made with pull cords or similar technology should have a safety device in place. 1st Choice Blinds are installed by experienced professional fitters. All blinds with pull cords, chains or similar hardware are always supplied with a relevant safety device that will break under pressure or alternatively can be stored out of reach. Pull cords and chains are always supplied in standard lengths. So please give us a call today, and find out how we can help you get the solution you are looking for!